So today we’re joined by GM Gilheru to talk about his deep, very core, idealistic D&D campaign: Solstice. The lands of Terra are a pretty cool place, steeped in the core of D&D ideals and dressings, have a seat and read our interview and be sure to stop by the Solstice home page and become a fan! I’m a gamer that makes games for a living. I started DM’ing 23 years ago with 0th edition Dungeons and Dragons, Gilheru has been my online persona for 15 years and I have been making video games professionally for a decade. I first tasted fame as a player in last year’s Game of the Month: Sins of the First Age and decided I wanted more. Solstice, tell us about it! The heart of Solstice is a shadow war that has gripped the world of Terra since the dragons of old had their power stripped from them by their very creations. Now the dragons fight to recover what they have lost while warring with themselves, the new gods and any adventurers foolish enough to dig too deep into the mysteries of the world beneath their own. It’s half “Sin War” from the Diablo video game series and half “Masquerade” from the old World of Darkness with a perspective that’s all D&D. I really like your description of Terra and that the game you’ve created is simply all about ‘Dungeons and Dragons’ really seem to hit the core of the game. What things made you decide to move in this direction? Back in 2002 Wizard’s of the Coast ran their Fantasy Setting Search, and the opportunity to have one of my ideas turned into an official product was beyond exciting. I threw together three or four different proposals and sent them off, hoping one of them might be selected. But since my name is not Keith Baker (the designer of Eberron), clearly that didn’t go as planned. And looking back on those proposals I understood why. Everything I had put together was rushed, half-baked and way too niche for a mass market project. So, without a looming deadline, I turned my attention to putting together a campaign setting I could be proud of, one that could incorporate the core themes of Dungeons and Dragons while still providing a unique experience. And though I still have a long way to go I feel pretty good about where I’ve ended up and the path in front of me. I’ve been gaming with members of this current group for six years now. A few have drifted away and new players have come and taken their place, but it has been a surprising stable experience for the most part. As for Solstice, the first campaign, a short lived 2 or 3 session adventure, happened about 9 years ago. Since then I’ve run four more campaigns, each one usually lasting around a year (the current campaign, Solstice IV, just had its one year birthday). There are a couple of DM’s in my current group, so there’s usually a lot of game rotation going on. So, Solstice seems like a very clean, simply laid out wiki, I really like your style! Do you do all of the design work yourself? I’ve converted years worth of written material into digital form for this wiki and it was important to me that this information be easily sorted through if someone went looking through it. So other than taking advantage of some of the templates provided by members ChainsawXIV and Arsheesh the design is my own. I’ve seen some great campaign pages on Obsidian Portal, but I tried to make the tools already present work for me. The biggest exception would be the little navigation buttons I added to the left side of most pages in the wiki. More of an experiment than anything else, I wanted to see if there was a simple and elegant way to use that space. 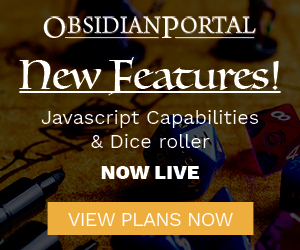 Do you get your players to participate on OP regularly? If so, do you have any tips for other GM’s out there who might be struggling with this? My players are kind enough to (mostly) keep their character sheets current, but other than that they are pretty hands off. And rather than try to provide some advice on how to get players more active, my advice is to instead not worry so much about it if they aren’t. Gaming is about having a good time, and if you have to bribe your players to participate in ways they don’t want to you’ve turned the experience into a chore. I would welcome any of them writing up character journals, but it’s more important that they are enjoying their experience with the campaign. How did you feel moving from the d20 system over to 4e? Also, now with the announcement of the next edition of D&D does this change the way you play the game now or in the future? When I first started the conversion I will admit I wasn’t terribly thrilled by the prospect. Suddenly a number of important game elements were undefined and many of them never came back. But looking back I think the conversion made the campaign stronger. Instead of being tied to this species or that monster I was able to distill the design down into what elements were truly important, even if the window dressing changed. So now, looking ahead, I’m more excited than anything else to see what a new edition will do to the world. That said, there is a particular milestone I have in mind I would like to reach before then. I wonder if my players might agree with this, but I particularly enjoyed the conclusion of the Solstice II campaign. This was still back in the D20 days and the party had decided on a group alignment of True Neutral (meaning everyone had to be neutral something or something neutral). This had the potential to be a tricky dynamic, but they managed to keep things together by staying away from good and evil. That meant the primary moral conflict was between law and chaos. For most of the campaign that difference in alignment sat in the background smoldering, but rarely coming intoe focus. That all changed in the hanging prison of the primordial gods where forces for law and chaos collided, enveloping the party in their war. As the players were exposed to the details of this conflict they split along alignment lines without any prompting from me, ending in an unexpected betrayal and an epic battle for the power to change the world. Alignment has never been the same since, but I was thrilled to see my players so embedded in their characters’ motivations that they would be willing to turn on each other to remain true to those personas. What do you mostly do when you’re *not* gaming? My recreational activities are fairly mundane. It’s a mix of reading and writing speculative fiction, watching anime and staying currently on the latest and greatest video games (with MMORPGs proving particularly addictive). As often as you can, be a player too. As a DM it’s easy to get lost in your world, your rules and your perspective. But if you are regularly a player as well you get to see from the other end of the table what things work and what things don’t. Just like they say the best writers read, the best DMs constantly remind themselves what it takes to keep the experience enjoyable for everyone. That’s it for this month guys, check back next month for another stellar campaign and be sure to keep nominating those you deem worthy of CotM glory, in the forums! Congratulations on receiving COTM. Solstice reads like an amazing campaign that is rich in details and campaign development. I also liked and appreciated what you said about the importance of DMs putting on the persona of players too. Although I mostly DM, I always play an NPC to keep the perspective of the player in mind. I’m looking forward to visiting your site and keeping up with your gaming sessions. Congrats again! Congratulations on COTM even though I’m not playing in the campaign at the moment I check out the updates from time to time. While I was playing I enjoyed being able to look up campaign information or house rules on Obsidian Portal without interrupting you. It’s nice to see your hard work can be appreciated by more than the folks around the table, and be an inspiration as well. Sweet interview, I particularly enjoyed the Solstice II highlight.